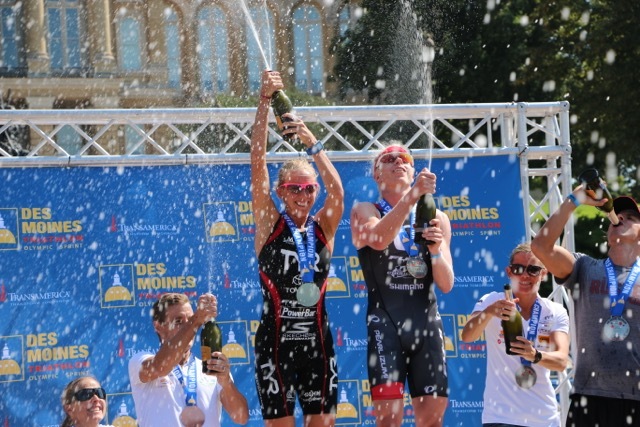 This past Labor Day weekend, I competed in the Des Moines Triathlon. This was the same race that has been taking place this weekend since 2011, but it has a new name and different sponsors. 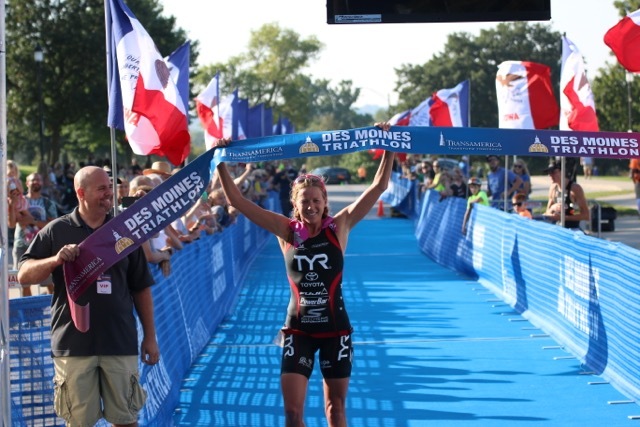 In the past Hy-Vee was the title sponsor for this race and made it’s mark on triathlon with some of the richest prize money pay outs in the history of the sport. I was fortunate to be part of this historic race from 2007-2010 (when I was and ITU race in June) and 2011-2012 (when it became on OLY non drafting race over Labor Day weekend). I missed the race the past two years when the course was changed to a one loop bike, so this was my first year racing on the new course. 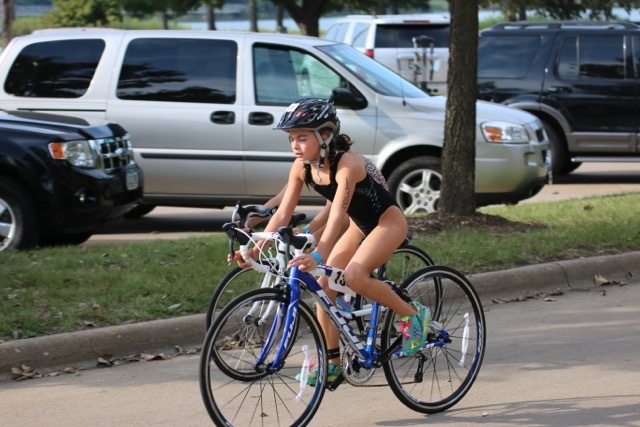 My race preparations were vastly different than any race I have competed in before. As I mentioned in an earlier blog, I suffered a fourth metatarsal stress reaction and had to take a month off running after the Pan American Games through the middle of August. I made a trip to Colorado Springs at the beginning of August. I met with the sports medicine team there to have a bone density test, run on the Alter-G, and train at the facilities. Nate, Caroline and I also got to catch up with some old friends! The positive news is that my bone density has improved greatly since last summer, so I am on my way to a full recovery. When I started running on the Alter-G and back on 100% body weight mid August, I was extremely apprehensive not to push too hard too soon. I started most of my runs on the treadmill that included a 3-5% incline for most of my running workouts. This way, I could still get my heart rate up and build leg strength, without much pounding on my foot. I never ran two days in a row and had a handful of runs outside prior to the Des Moines race. Caroline suffered a cold several weeks before the Des Moines race and the weekend before the race, I could tell that my body was fighting off the cold. The cold seemed to linger all week, so I was hoping I would not be affected on race day. Nate, Caroline and I were very excited to see our Minnesota family and we were planning a reunion of sorts in Des Monies. We all stayed together at a hotel in West Des Moines and I had three nieces compete in the kids race on the Saturday before my race. 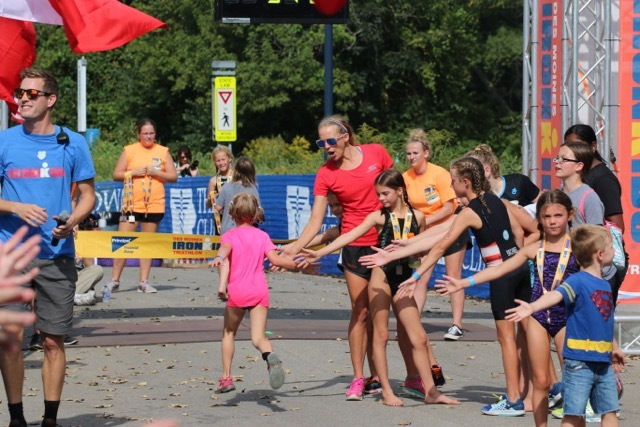 I got the opportunity to cheer on the girls and the last 15 min of the race, stand in the finishing shoot and give kids high-fives before they crossed the tape. 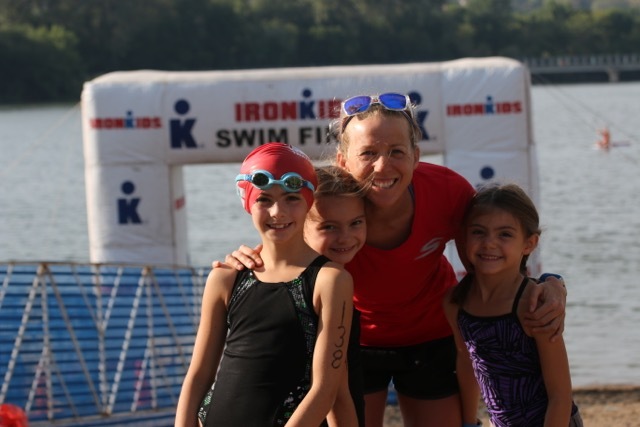 Watching the kids race, gave me some inspiration and joy to help me prep for my own race. I was feeling pretty lousy the day before the race, but I tired to put those feelings behind me and just take everything in stride. After the kids race,k I did a 30 min spin. I tried some efforts, but felt spent, so decided to just shut it down. I called it a day for anymore pre-race tune-ups and skipped trying to fit in a swim. Race morning, I wasn’t too nervous. I was just happy to be racing and back in the groove. Transition was across the lake from swim start, so I jogged over to the swim. Before the gun went off, I thought to myself to put everything behind me, not worry about my injury, my cold, but to just believe in myself and race. 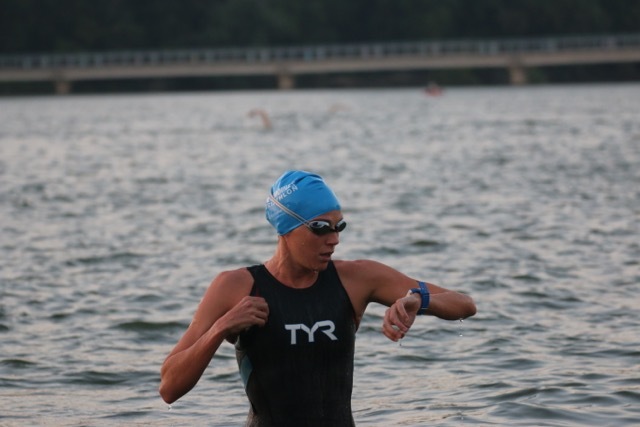 I started off the swim at a controlled pace. It was a short run in and after tripping a little running into the water, I quickly moved over a few spots the outside. After the first turn buoy, I moved into first position and held that position throughout the remainder of the swim. The last 600 meters were absolutely brutal for sighting. All I could see was bright, blinding sun. I swam straight for the sun and fortunately did not swim too far off course. I had a good transition and was first off on the bike. Once on the bike, I felt good. My breathing was not too hampered by my cold and I felt strong. I enjoyed this new bike course. The first half was flat and fast and the second half had several long rolling hills. The terrain had lots of opportunity to put your head down and go! 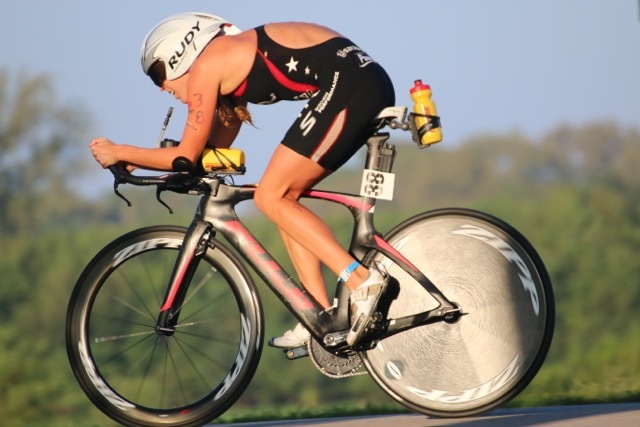 Checkout my Quarq Pwoermeter file presented by Trainingpeaks! Running off the bike, I had a 2:30 lead from second and a 4:30 lead over Mirinda. 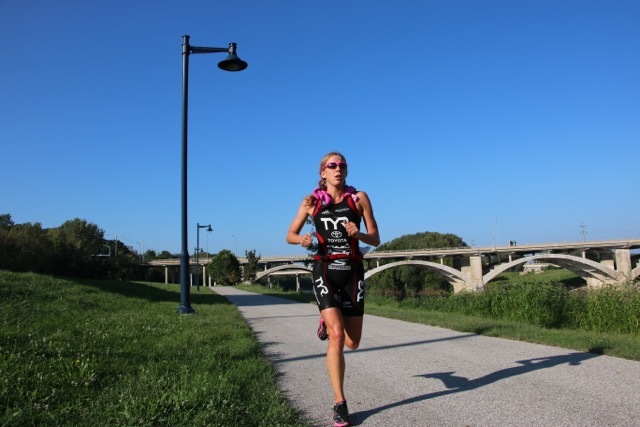 Miranda is an amazing runner and I knew that she was capable of closing a big time gap. I knew that my running legs would lack any sort of speed, but just wanted to keep my form together and keep a nice solid tempo pace. At the halfway mark, I was feeling pretty good, but had a heavy feeling in my legs. At the end of the run I felt like I was in mile 10 of a half race, but very happy with my performance with just a few weeks of training under my belt. The finish was brutal, and I quickly remembered that big hill all the way to the finishing tape! Just before I crossed the finish line, I got to see all my family and break the tape in first. I am looking forward to finishing off the season with some strong performances. Thank you to all my sponsors, family and friends. Hope everyone had a wonderful summer and enjoy the upcoming fall season.